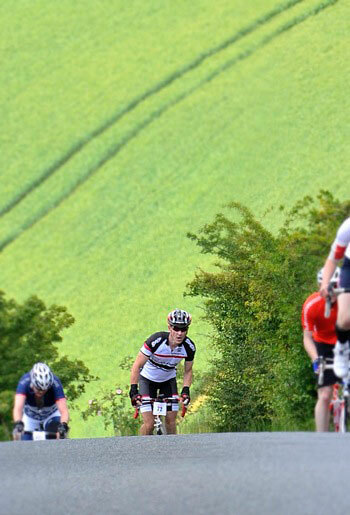 The Great Western Sportive returns to the sweeping roads of Wiltshire for its fourth year on June 16th. Once again based at the Nationwide Building Society HQ on the edge of Swindon, the course takes you quickly out of town and into the beautiful wilds of the Marlborough Downs for a peerless days riding! In its three outings to date, the Great Western has established itself as a favourite with riders, due to its stunning scenery, well surfaced, quiet roads, and excellent course. The route passes through the heart of one of Europe's most ancient landscapes. The magnificent standing stones of Avebury are one of the most visible reminders of this, but barrows and earthworks litter the downs, lending a real sense of spectacle to the ride. A younger but no less impressive piece of history is etched in chalk on the side of White Horse Hill, giving you something to look as you work your way up it's stiff gradient. Some clever course design shapes this event too. The course is not short of steep and challenging climbs, but the descents that follow all seem to be of the long and flowing variety, that go on for miles at a time. There are stretches through the Lambourne Valley, as you spin effortlessly alongside the bubbling summer stream, that remind you exactly why it is that you ride a bike! As you'd expect from the most experienced events crew in the sportive market, you get full event support, excellent course marking, fully stocked feed stations, finish line ride timing, good quality catering and all the attention to detail that Southern Sportive have built their reputation on. Plus, there's a smart, high quality event t-shirt for all finishers.